In recent years energy transportation and storage stocks and Master Limited Partnerships (MLPs) have become some of the most popular high dividend stocks for income investors to find attractive yields in this record-low interest rate environment. 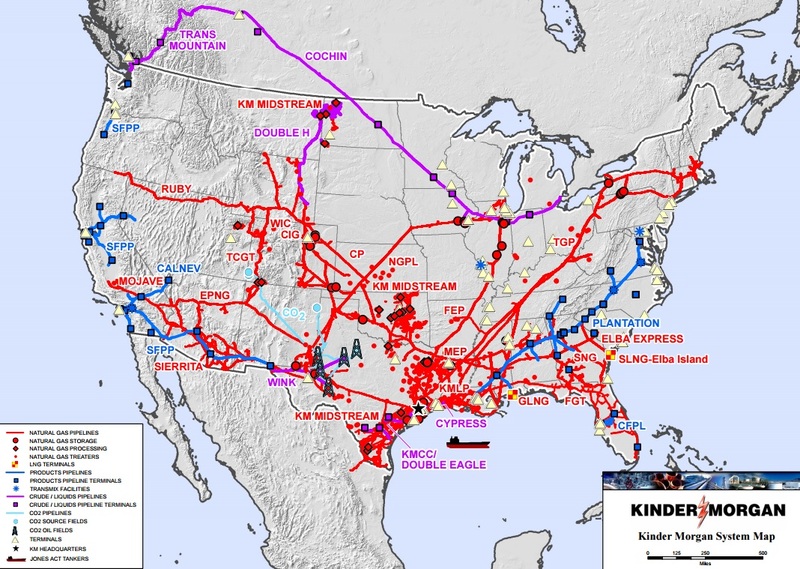 Kinder Morgan (KMI) is one of the oldest names in this space, having helped to popularize the sector with its previous MLPs, Kinder Morgan Energy Partners and El Paso Energy Partners, which were acquired in 2015 by Kinder Morgan Inc (the general partner, sponsor, and manager of their assets). But thanks to the worst oil crash in over 50 years, Kinder Morgan quickly became a cautionary tale about what can go wrong, especially when management takes on too much debt in a highly cyclical industry. 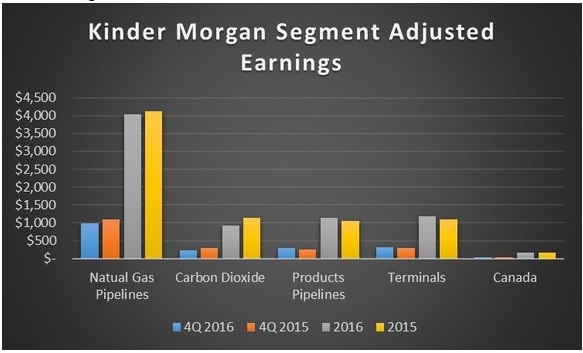 Let’s take a closer look at Kinder Morgan’s business to see just what went wrong for Kinder and more importantly, if management’s turnaround efforts make this a high dividend stock worth owning in our Conservative Retirees dividend portfolio. With 84,000 miles of natural gas, oil, CO2, and natural gas liquids (NGL) pipelines, processing facilities, and 180 distribution and storage terminals, Kinder Morgan is North America’s second largest energy infrastructure operator. Natural Gas Pipelines (55% of earnings before depreciation & amortization): 69,000 miles of pipelines that transport 38% of America’s natural gas each day. Products Pipelines (16%): America’s largest transporter of oil products, shipping 2.1 million barrels per day through its 9,000 miles of pipelines and 60 distribution terminals. Terminals (16%): America’s largest oil and petroleum product storage network, with 152 million barrels of capacity. Carbon Dioxide (11%): America’s largest producer (1.2 billion cubic feet per day) and transporter of CO2, for enhanced oil recovery, via its 1,300 miles of CO2 pipelines. Canada (2%): One of Canada’s largest oil pipeline operators with six major pipeline, storage, and export terminal systems. Since it’s a midstream operator, 91% of Kinder’s cash flow is derived from long-term, fixed-fee contracts, which helps to generate far more stable results than other sectors of the energy industry. However, as you can see from the table below, despite these contracts, many of which minimize volume risk by requiring energy producers to ship a minimum amount of product, the collapse in energy prices has resulted in a continued earnings decline in natural gas pipelines and CO2, which account for more than 65% of total profits. Kinder experienced many years of strong growth during the boom times, when oil prices were around $100. 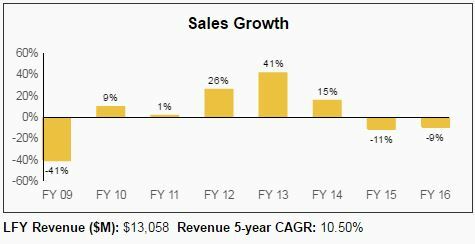 This was due to the torrid pace of new projects put into service, as well as the rollup the company underwent in 2015 when it acquired all of its MLPs. Unfortunately, despite its tollbooth business model, the company’s sales and profitability haven’t fared well during the oil crash. That’s largely due to the business model, which involves Kinder paying out the vast majority of its distributable cash flow, or DCF (EBITDA – maintenance capex), as dividends and using debt and equity markets for its growth capex needs. In the past few years the company has had to raise a lot of debt and equity at unfavorable rates, resulting in very poor profitability and returns on investor capital. Unfortunately, due to one of the largest debt loads in the industry (more on this in a moment), management had to make deleveraging a priority, which has involved the sale of numerous assets, including 50% of its Southern Natural Gas pipeline system to Southern Company (SO), for $4.15 billion. In addition, Kinder has also recently sold off 50% of its Utopia Ethane pipeline as well as the last 50% of its Parkway Refined Products pipeline. The company is also considering selling off a 50% stake (turning it into a joint venture) of its largest growth project, the $6.8 billion Trans Mountain Pipeline expansion, which would greatly lower the company’s capital spending needs and help pay down debt with the proceeds. In addition, Forbes recently reported that Kinder is considering selling off its oil & CO2 assets (which are the most profitable segment when oil prices are high) for as much as $10 billion. The problem of course is that selling assets is a one-off, short-term solution, but one that will permanently impair Kinder Morgan’s future DCF (what pays the dividend) growth. What’s worse, because of the oil crash, Kinder Morgan’s backlog of growth projects has been shrinking at an alarming rate, from a peak of $22 billion in mid-2015, to just $12 billion today. The vast majority of this shrinkage in future potential growth is courtesy of deferred and cancelled CO2 projects, whose economics no longer make sense unless oil prices recover significantly. While management’s aggressive asset sales might make sense in the short-term, in terms of strengthening the balance sheet, Kinder Morgan has very little growth potential remaining, especially as a percentage of its already vast assets. Or put another way, what remaining cash flow growth the company can look forward to is likely to be too small to move the needle in terms of DCF growth, making long-term dividend growth potential marginal at best. Kinder Morgan faces numerous risks to its already limited growth. The first is the potential for oil prices to remain at today’s low levels for several more years. In fact, current long-term futures contracts for West Texas Intermediate, the U.S. oil standard, have stabilized in the $50s…all the way through 2020. While that doesn’t necessarily ensure that oil prices remain half of what they were before the oil crash started, it means that the market is not expecting an oil recovery anytime soon. This is due to three main factors. First, slowing global economic growth, as well as improving global fuel efficiency, is creating slower demand growth for oil. Second, the oil crash has forced U.S. shale producers to become incredibly efficient, which has lowered the breakeven price for most U.S. shale formations to levels where reasonable returns can be achieved at far lower prices. In fact, since oil prices bottomed at $26 in February of 2016, the number of oil rigs drilling in U.S. shale formations has started rising quickly. Specifically, since bottoming in early May 2016, the number of U.S. oil rigs has soared over 70%, which means that U.S. production may soon start to climb, offsetting the recent OPEC production cuts. The world could remain oversupplied with oil for several more years. In addition, global storage capacity is at all-time highs, and that inventory will likely take years to work off, even if oil production were to decrease significantly. All of which means that investors hoping that Kinder Morgan’s fortunes might be turned around quickly by a fast crude recovery (which would return many of its CO2 projects to its backlog and increase CO2 business margins) are likely to be disappointed. Next there is Kinder Morgan’s mammoth debt burden, which despite its asset sales, continues to weigh on the company’s growth prospects. Worse yet, with interest rates now rising, rolling over that debt in the future is going to cost more and keep the company’s interest expense burden far higher than many of its rivals. This brings us to the final big risk, that Kinder Morgan’s business structure keeps the company at the mercy of its volatile stock price to fund future growth. As we saw during 2015, when a collapsing share price locked Kinder Morgan out of the equity capital markets (and helped force its 75% dividend cut), overly bearish investor sentiment can trap highly leveraged midstream operators like Kinder into a downward spiral. This can create a lack of liquidity which forces management to make painful decisions that can quickly wipe out what was once a promising long-term dividend growth thesis. Kinder Morgan has a Dividend Safety Score of 55, meaning that the company’s current dividend is about as safe as the average stock’s dividend in the market. This is a meaningful change compared to the company’s safety prior to its dividend cut. In fact, just before management’s shocking decision to cut the dividend in December 2015, Kinder Morgan’s Dividend Safety Score was an 8, indicating very high risk of a dividend cut. Today, Kinder Morgan’s lower dividend amount appears to be more sustainable, thanks in part to the company’s dividend coverage ratio (DCF/dividend cost) of 4.1. However, while Kinder Morgan’s 12.5 cents per share quarterly payout is much smaller than last quarter’s 51 cents in DCF per share, all of the remaining spare DCF is allocated to paying down debt and funding the completion of its growth backlog. Thus there really isn’t much of a cushion in case its cash flow declines, as it did 7% and 6% in the last quarter and full year 2016, respectively. In fact, Kinder Morgan’s 2017 guidance of $4.46 billion in DCF means that after its $1.1 billion dividend and $3.2 billion in expected capital expenditures, there is only about $100 million in excess projected DCF. That reserve could easily vanish if energy prices dip further. Even if they don’t, Kinder will have little ability to pay down its mountain of debt without resorting to further joint ventures or asset sales. In fact, due to this declining DCF per share, Kinder has had to continually cut back on planned growth capex in the past year in order to maintain its current payout. Speaking of the dividend, Kinder Morgan’s 2.3% yield is far lower than most of its higher-quality, less leveraged, and faster-growing rivals, such as Enterprise Products Partners (EPD), Magellan Midstream Partners (MMP), and Enbridge Inc (ENB). While Kinder Morgan’s balance sheet may not necessarily be in worse shape than the industry average, the fact remains that it is only just clinging to its investment grade credit rating by a hair. In fact, it was Moody’s (MCO) threat to cut its credit rating to junk status, which would have sent its refinancing costs soaring, which resulted in the dividend cut at the end of 2015. In addition, the high interest costs the company is facing is a big reason that its returns on invested capital are so low, which makes finding profitable growth much harder to come by. Kinder Morgan’s long-term debt maturities average $2 billion to $3 billion over each of the next five years, but the company’s refinancing risk is relatively low in today’s credit environment. The company also has nearly $5 billion of excess capacity it its credit revolver, providing healthy liquidity. Overall, Kinder Morgan’s current dividend seems likely to remain safe under today’s market conditions. Kinder Morgan has a Dividend Growth Score of 10, indicating that investors should expect little to no dividend growth in the next few years. Now in fairness to Kinder Morgan, analysis have been speculating in recent months that management’s aggressive asset sales could result in renewed dividend growth in the next few years. However, dividend lovers should be skeptical of that because as long as energy prices remain low, Kinder Morgan’s ability to raise external growth capital will be severely limited. After all, management needs to use the vast majority of the company’s cash flow to complete its backlog, in order to grow DCF and strengthen the balance sheet (i.e. lower its leverage ratio). If not, then the only way to pay down its mountain of debt will be through ongoing asset sales, which will likely impair the company’s DCF and dividend growth prospects going forward. Put another way, until Kinder Morgan can get a handle on its debt situation, and/or energy prices recover sufficiently to boost its share price and reopen its access to cheap equity growth capital, Kinder Morgan’s dividend isn’t likely to grow much, if at all, for several years. Despite the fact that Kinder Morgan’s fundamentals haven’t improved much (other than its impressive de-leveraging efforts), its share price has risen by 66% since mid-January 2016. That’s largely a result of oil prices rebounding off their February 2016 lows. However, that strong rally means that investors hoping to profit from Kinder Morgan shares due to undervaluation are possibly out of luck. Even Warren Buffett sold out of his Kinder Morgan position in his dividend portfolio during the fourth quarter of 2016. As you can see, Kinder is trading at a significant premium to its historical price / operating cash flow (P / OCF) as well as its historical median yield. Kinder Morgan’s current dividend yield is also pitiful compared to the median industry yield of 5.1%. In fact, Kinder Morgan’s yield puts it in the bottom 1% of global oil & gas midstream stocks. At today’s share price, investors seem to be paying a fairly high premium in order to own a lower quality and lower yielding midstream operator, one with poor and declining growth prospects. Kinder Morgan’s management made the correct, if painful, decision at the end of 2015 to cut the dividend. It was in the best interest of the company’s long-term viability. However, the fact is that Kinder Morgan remains a low yield, poor dividend growth, turnaround story. The company is still highly dependent on a recovery in energy prices that is unpredictable and completely beyond its control. With superior midstream options available, including ones with higher yields, stronger balance sheets, more conservative management teams, and better long-term payout growth prospects, there is little reason for investors living off dividends to invest in this struggling pipeline giant.